Your moderators at Hellas are Tacitus the Younger and logicon. The Featured Member for Hellas in First Quarter, 2006, is logicon. Hellas, Greece. From its early rise along the Aegean Sea, the ancient cultures of Mycenae and Crete that rose and fell after leaving their marks upon the world, up to and through classical Greece. Sparta, Athens -- these are only the major of many city-states sometimes locked into war; sometimes brought into alliance against foreign enemies. 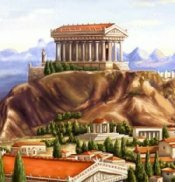 The city-states of Greece were the birthplace of many modern ideas; explore with us the realms of philosophy, of art, of architecture.